“When I first began working at Eastern Mennonite College,” recalls professor emeritus Wilmer Lehman ’57, “teaching at EMC was seen as a kind of mission of the church.” Back in the era of Sputnik, math education was a carefully calculated national priority, and teachers of mathematics were in high demand. This small private school struggled to compete with the demand for higher-level mathematicians generated by Cold War anxieties, especially given its status as a Christian-pacifist institution that garnered no funding for defense-related work. But being a devout Anabaptist, Lehman opted to take the proverbial “road less traveled” in U.S. academia and returned to teach at his alma mater two years after graduation. “When I came [for the 1959-60 school year], I did not know what my yearly salary would be,” Lehman says. “I found that it was about $2,500, spread over nine or ten months – all of which it took just to live. We had to scrape by in the summers.” Later, Lehman would earn a master of arts in teaching with a math concentration from Cornell University and become a full professor at EMU. Lehman became the foundation of what has grown into a thriving program in the mathematical sciences. Early in his 40-year career at EMU, he taught Millard Showalter ’62 and then recruited him to be a fellow faculty member. Lehman’s education continued, even as he was educating another generation. In the early 1990s, Lehman earned a second master’s degree (this time an MA in Christian leadership, focusing on counseling) at Eastern Mennonite Seminary in order to prepare himself for leadership roles in his congregation, Mt. Clinton Mennonite Church, and the conference to which it belongs. Like Lehman, Showalter earned his graduate degrees while working for minimal pay at EMU. Showalter holds two master’s degrees, one in math from the University of South Carolina and another master’s in arts (with a math major) from Vanderbilt, and an EdD from the University of Virginia. Lehman and Showalter taught in tandem for decades – serving under four presidents and seven academic deans – until Showalter retired in 1998, with Lehman following in 2000. Both were beloved for their willingness to work one-on-one with students having difficulty in math, acting as both tutor and encourager. In addition to Lehman and Showalter, four other EMU alumni taught mathematical sciences for extended stints: two members of the class of 1962, Del Snyder and Donald C. Miller (who also attended the seminary in 1976-77); Roy E. Heatwole ’64; and John L. Horst ’60, who taught both physics and mathematics and coached award-winning teams in international math-modeling competitions. When Joe Mast ’64 was a student at EMU in the early 1960s his long-term goal was to be a high school math and physics teacher. “At the time, I did not aspire to teach at the college level,” he says. “[But] I had a great interest in astronomy and electronics.” His physics professor, Robert Lehman, encouraged him to pursue astronomy and return to his alma mater. As a student at EMU, Mast helped to manage the WEMC radio station as chief engineer and station manager and was part of the Astral Society, which focused on astronomy. In the Cold War era, space-race money was available, and he received a special fellowship that allowed him to pursue a master’s degree and a PhD at the University of Virginia, both in astronomy. Upon returning to then-EMC as a faculty member, the college received its first computer under a grant to small colleges. Mast became EMU’s first computer science professor. On sabbatical in 1978, Mast went to JMU, where he studied computer science courses, and later received a second master’s degree in computer science. He returned to EMU, where he ushered in a two-year associate’s degree in computer processing, followed several years later by a major in computer science. In response to a need by fellow EMU employees for banking services, in 1969 Mast helped to found Park View Federal Credit Union, an idea originating with Dan Bender and developed by Robert Lehman. Three years later Mast began managing the credit union out of his office in the basement of the Suter Science Center, continuing for 10 years. One of EMU’s best-known mathematical sons is Robert P. Hostetler ’59, who retired from teaching in 1996 and only stopped writing textbooks in 2007. He now lives as a retiree within walking distance of EMU. Hostetler holds a bachelor’s degree in secondary education (math certification) from EMU, a master’s degree in mathematics, and a doctorate in mathematics education, both graduate degrees from Penn State University. Hostetler is perhaps one of the most successful authors of math education texts in any language; his books have been used widely by students and teachers for decades. About 300 titles with Hostetler’s name as author or co-author reside on the Barnes and Noble website. Google Books puts the total count of books, editions, study guides – anything with his name – at about 2,400. Some of Hostetler’s dozens of textbooks have been translated into Spanish, Portuguese and Chinese; they range from college algebra, trigonometry and calculus to The Mathematics of Buying. Outside of the university, Hostetler has shared his faith and enthusiasm for teaching and learning as a Sunday School teacher for more than 40 years. At the University Park Campus of Penn State, James L. Rosenberger ’68 is an internationally recognized statistician, with a master’s degree from Polytechnic Institute of New York and a doctorate from Cornell University. 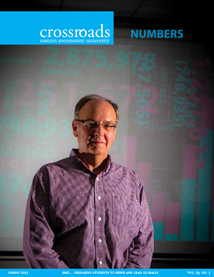 He says that EMU professor Roy Heatwole first sparked his interest in working with statistics. Graduating with a major in math, Rosenberger was able to secure 1-W conscientious objector status during the Vietnam War by working as an analyst and programmer in the Cardiovascular Research Center at New York University Medical Center. During the past decade, Rosenberger has guided the development of an online professional master of applied statistics program at Penn State, aimed at mid-career professionals who cannot return to graduate school full time. “More than 500 students enroll in our graduate courses each semester, allowing us to extend the reach of statistics education beyond the campus,” he says. Rosenberger’s accomplishments include: a 2011 Distinguished Service Award from the National Institute of Statistical Sciences, election to Fellow of the American Association for the Advancement of Science, serving as program director at the National Science Foundation, and lecturing around the globe. One of Millard Showalter’s students, Merle Reinford ’72, has gone on to earn a graduate degree in math (where most of his courses were easier than those at EMU, he says) and to devote nearly 40 years to teaching math students at Lancaster (Pa.) Mennonite High School. Some semesters, he also teaches math as an adjunct at Millersville University. Sharpening the minds of his high school students, he has spent 33 years coaching competitive chess, eventually getting elected president of the regional scholastic chess league. Reinford’s coaching successes are dramatic. In 33 years his high school teams won 11 league titles, with runner-up success 13 more times. Reinford’s chess teams have accumulated a plethora of state competition titles, with a record of 315 wins to 90 losses and 23 ties. “I have used my enjoyment of the game to play chess with homeless men,” he says. “I am not sure if you could call that a ministry or not,” given how much fun he has. Ressler is now focused on pursuing environmental justice. He volunteers at Community Mennonite Church of Lancaster, where he pays a voluntary “gas tax” to discourage driving and fund green upgrades for the congregation. He is an avid bicyclist, another love with roots at EMU. “One of my housemates at EMC got me to buy a used bicycle. I loved riding around Harrisonburg and started commuting by bicycle to work. I estimate that I have ridden about 50,000 miles since I graduated from EMC.” Ressler believes that bicycles may help save us from the problems of internal combustion. Deirdre Smeltzer ’87 returned to EMU in 1998 after graduating from the University of Virginia with an MS and a PhD in mathematics. Recalling her undergraduate years at EMU, Smeltzer credits two professors, Millard Showalter in Calculus II and Del Snyder in Discrete Math, for nurturing her interest in higher-level mathematics. As an EMU faculty member, Smeltzer has taught courses on more than two dozen topics in her field and is author or co-author of a number of peer-reviewed articles and a textbook. In the current academic year, she has directed EMU’s extensive cross-cultural programs on a part-time basis. In the late spring, she was named EMU’s vice president and undergraduate dean, effective July 1, 2013. After consulting with his former professors, Deirdre Smeltzer and Owen Byer, Risser was “hooked” on the idea of grad school, and decided to pursue a PhD in statistics. He is now a doctoral student at Ohio State University and recently received his MS (also at Ohio State), where he is also involved in research on HyFlex (hybrid, flexible) education methods. Risser says he hopes to have the kind of impact on a future generation of college students as his EMU teachers had on him. One Response to "Academics In the Field of Numbers"
Hey As you know that most of the people were the people were addicted to play the best cards game ever so if you were interested in playing such online game then just from here https://heartsgameonline.net play hearts game online without any charges.